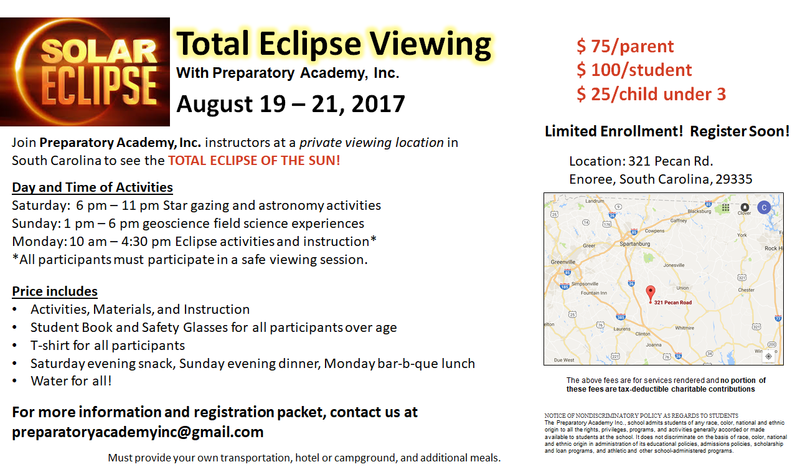 2017 Solar Eclipse Field Camp - Preparatory Academy, Inc. Here's a great opportunity to see the TOTAL SOLAR ECLIPSE at a private location in South Carolina. We have arranged a 3-day weekend field camp experience for students and their families. All are welcome - you do not need to be registered with the school to participate in this event. We will have telescopes for night viewing Saturday evening along with some other astronomy-themed activities and then meet again on Sunday afternoon for age-appropriate ecology, earth, and space activities that are fun and educational. Contests scavenger hunts, science experiments, microscope activities, and even some speakers. Then, Monday is the big event! We will meet in the morning and learn more about the solar eclipse, eat a barbecue lunch, learn how to watch safely and then share the event as the moon moves between the Earth and the Sun. Evening snack on Saturday, dinner on Sunday, and a snack and barbeque lunch on Monday. Approximately 8 hours of age-appropriate activities for adults and students older than 3. Each family is responsible for arranging transportation and accommodations. We recommend forming carpools. Parents must remain on property the entire time their children are on the property. We must have a release for anyone on the property. All participants MUST attend a safety seminar as their first activity at the event. There will be age appropriate activities offered for students and adults. Students aged 8 and older may attend activities unaccompanied by a parent. Family activities will be available for those with students under 8 years old. Children under 3 must remain with a parent at all times. Some activities involve foods that may contain allergens. If allergies are an issue, please bring food. This is an outdoor event. Please bring sunscreen and bug spray. Chairs and shade tents are optional, but encouraged. A family gathering area will be provided. In case of cloud cover, we will have alternate methods of viewing the eclipse. As this is a family event, no smoking or alcohol is permitted on the property. To register: Download the Registration Packet and Liability Waiver, complete and return it with your deposit (below). A $25 per-participant non-refundable deposit for materials and t-shirt is due upon registration. Final payment is due on or before August 1, 2017. Please provide the following information for all who are attending, including parents. For more than 8 participants, please complete 2 forms, and we'll put them together on our side. Checks can be mailed to: Preparatory Academy, Inc.
​The above event fees are for services rendered and no portion of these fees are tax-deductible charitable contributions. NOTICE OF NONDISCRIMINATORY POLICY AS REGARDS TO STUDENTSThe Preparatory Academy Inc., school admits students of any race, color, national and ethnic origin to all the rights, privileges, programs, and activities generally accorded or made available to students at the school. It does not discriminate on the basis of race, color, national and ethnic origin in administration of its educational policies, admissions policies, scholarship and loan programs, and athletic and other school-administered programs. We are seeking sponsors for this event. Our instructors are volunteers, mostly from the University of South Florida. We would like to be able to reimburse their travel expenses. We would also like to provide scholarships to families in need. Sponsors will have their name on t-shirts and promotional materials.